Consider this a mass review, or comparison, or whatever. My favorite highlighter will always be an eye droppered Platinum preppy with a 50/50 mix of Noodler’s Electric Eel and Year of the Dragon inks. It’s the best highlighter ever. I had to test out some highlighter pencils, simply to satiate my own curiosity. It also makes sense for when I’m reading books printed on cheap pulpy paper and my Preppy soaks through the cheap paper like it’s TP. Price- These things get used, and used pretty quickly when I’m reading a lot of text for school. Cheaper is better. Texture- This can get broken into 2 subcategories: smooth and crumble. Smooth refers to how the pencil applies to the page- does it glide or catch? When highlighting I want glide. Crumble has to do with how the pencil responds to pressure and application to the page. Does it crumble and make a mess or is it strong and clean? Transparency- Can I easily see through the color or do I need to underline with the highlighter? If I can’t see through it then what is the point? Sharpening- How well, or badly, does the pencil sharpen? Am I wasting a ton of core in each sharpening of the pencil? 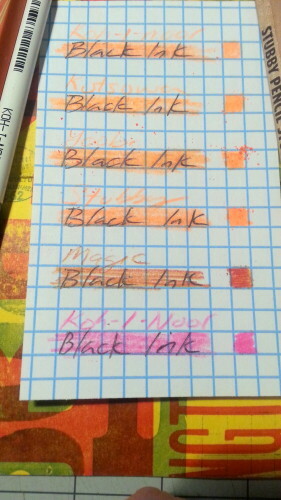 Using this criteria I looked at a selection of highlighter pencils and tested them out. The best is listed first and the worst last, however none are truly horrible, just when compared to the others, not as good. These are listed in the order of best to worst. These are reliably good highlighters. Transparent and smooth with minimal crumbling. They sharpen well unless they have been abused. They come in a 6-pack and are reasonably priced. My package was roughly $6 at Artist and Craftsman but they are a little more on Amazon. I picked this up at Jetpens for $3, which is it’s only downfall. It would be the best of the best if it weren’t $3 a pencil. It does come packaged with an extender and sharpener in one.These are perfectly smooth and transparently. They sharpen perfectly each and every time. If you don’t use your highlighters often this might be the highlighter pencil for you. I scored this jumbo pencil in a swap but they are available on Amazon. They are sold in sets of 4 of one color, 12 of one color, or rainbow packages. They average about $4 each. They are the largest of any of the pencils in length, with a thick core that sharpens well. 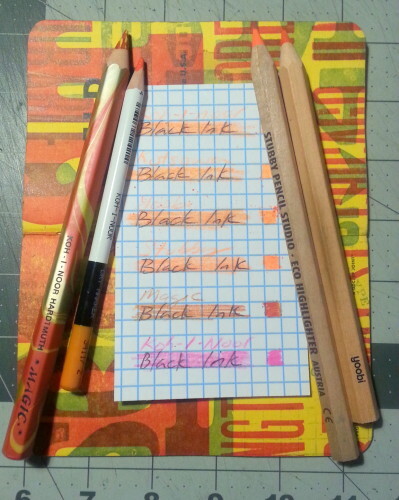 If you like raw wood pencils, these will make you happy. That being said, the core does crumble in use, not as bad as the worst of the lot but enough to make note of the crumble. The core is nicely transparent so there is that. At $4 each, they are a little pricey for me, especially since the core is crumbly. Available from Target and Yoobi for $3.49 a set or $11 on Amazon. I’m not sure why Yoobi has decided to price their products so expensive on the ‘zom but they have. Anway way, these are also a jumbo pencil, in lightly finished wood. They look great with a nice black imprint of the yoobi name on one side. There are 4 colors in a pack, with 2 yellow pencils. These sharpen well and are mostly transparent but I think a tad too dark over black text. The core itself crumbles and leaves a mess all over the page. I find myself sharpening the pencil all the time because the tip has crumbled off. If you are looking for a cheap alternative with a good cause, these are it, but they aren’t going to convince anyone to give up a marker style highlighter. This is a jumbo colored pencil and not really intended as a highlighter but the blend of colors works well for editing and underlining. It is fairly opaque, which is why it does well for editing and underlining. It sharpens well and has a fun marbled paint job. Due to it’s multicolored core it can be a bit crumbly but it does okay. At $1.50 a pencil these aren’t a bad price for editing, but as a highlighter, meh. Over all, I find myself reaching for the Koh-i noor Dry Marker over and over. They are regular pencil sized and I can get a nice broad tip going, then sharpen up in any sharpener. They work well and are priced right, when they can be found. The Kutsuwa is the better highlighter over all, but just so darn expensive. Also I chewed through one in a week of use. It was a heavy reading week, but still, gone. If you are looking for a highlighter, you’ve got some choices. This entry was posted in Review and tagged highlighter, koh-i-noor, koh-i-noorUSA, pencil, yoobi on 20160301 by leslie. In one of my last CWPE orders I added the $1.75 Thermoplastic to my cart. It was a whim, as if I needed another eraser. I ordered the teal, because I really like teal. Anyway, I was looking for a pocket eraser that would stand up well without needing protection from the wear and tear of pocket carry. 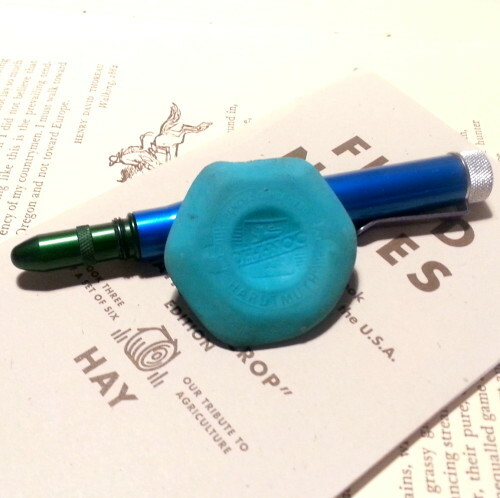 Anyway, this hexagonal teal eraser is a nice size and shape for both pocket carry and using as a fidget and worry stone. It is a decent general eraser but it doesn’t do as good a job as the Sakura foam. It cleans well enough for writing but it is too hard and stiff to really get deep into the fibers of the paper, so a little bit of graphite remains. It does a decent enough job for quick notes and notebook use. I was happy with how well it did with the majority of my pocket notebooks. The hexagonal shape allows for many corners and edges for detailed erasing and getting into single lines for erasure. It wears well and for a quick eraser doesn’t leave a ton of crumbs on the page. It does leave crumbs though, so be aware you’ll be dusting off your page and desk after useage. It isn’t gritty so it is gentle on the surface of your page. It isn’t as aggressive as a Pearl or other silica containing eraser. Overall, it’s not a bad eraser. It feels nice in the hand and is gentle on the paper. Granted it doesn’t remove all the graphite but that isn’t really needed for notes and writing. It is worth the price, plus it is a really really pretty teal color. 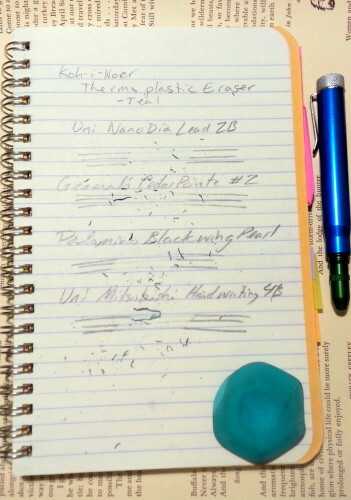 This entry was posted in Review and tagged EDC, eraser, koh-i-noor, pocket, teal, thermoplastic on 20160202 by leslie.